The Canadian Transportation Agency (CTA) had an exceptionally productive year in 2017-18. One of our key projects, the Regulatory Modernization Initiative, made excellent progress. Consultations on new and updated regulations in the areas of accessible transportation and of air licencing, charters, and insurance wrapped up, and preparation of the regulations began. On accessibility, the CTA continues to be guided by the ambitious goal of helping to make Canada's national transportation system the most accessible in the world. Meanwhile, the Government tabled proposed legislation (Bill C-49) giving the CTA the authority to make regulations that set out minimum airline obligations to passengers in a number of areas, creating a new mechanism called long-haul interswitching for shippers that rely on freight rail services, and enhancing other shipper-focused remedies. The Bill was debated through much of the fiscal year and received Royal Assent shortly after it ended, leading to stakeholder and public consultations on new air passenger protection regulations and updated rail-related regulations. The public's interest in air travel issues was reflected in the attention garnered by the hearing into the July 2017 tarmac delays of two Air Transat flights, and in the continued surge in air travel complaints, which numbered an unprecedented 5,500 in 2017-18 – an eight-fold increase since 2014-15. About 95 per cent of those complaints were resolved through the informal processes of facilitation and mediation; the remainder through adjudication. Finally, work on a data-driven, risk-based Compliance Assurance Program – which will help the CTA direct finite monitoring and enforcement resources to areas where the likelihood and/or impact of non-compliance are highest – advanced well. The CTA was grateful that in recognition of its expanded mandates and growing workloads, the Government proposed, and Parliament approved, its first funding increase in two decades. The ability of the CTA to deliver so many initiatives and services is a credit to its people: the Cabinet-appointed Members who make adjudicative decisions and regulatory determinations, and the public servants who provide them with support and advice. The CTA's Members and staff work hard every day to discharge their responsibilities with professionalism and impartiality – and in so doing, to foster a competitive, efficient, accessible national transportation system that contributes to the economic and social well-being of all Canadians. Advanced the Regulatory Modernization Initiative by completing public and stakeholder consultations for two of four phases -- accessible transportation and airline licensing, charters and insurance – and beginning the preparation of the regulations. Continued to manage a rising number of air travel complaints where the CTA received 5,500 complaints in 2017-2018 as compared to an average of 700 complaints annually for the years 2012 to 2016. Continued to pilot a new risk-based, data-driven Compliance Assurance Program. Undertook targeted outreach activities to raise public awareness of the CTA's services. Held a high-profile public hearing into tarmac delays affecting Air Transat flights in July 2017. The CTA is an independent, quasi-judicial tribunal and regulator that has, with respect to all matters necessary for the exercise of its jurisdiction, all the powers of a superior court. For more general information about the organization, see the “Supplementary information” section of this report. Canada's transportation system is a complex, rapidly-evolving network that is vital to the county's prosperity and social cohesion. As an independent, quasi-judicial tribunal and regulator that makes decisions on a wide range of matters involving federally-regulated modes of transportation, the CTA has seen its legislated mandates and demand for its services grow over the last decade. The Transportation Modernization Act (Bill C-49), which was tabled in May 2017 and passed a year later, gave the CTA new responsibilities, including the making of air passenger protection regulations and the adjudication of applications from shippers reliant on freight rail service for access to a new mechanism called long-haul interswitching. The CTA also continued to advance its Regulatory Modernization Initiative (RMI) with the goal of ensuring that the regulations it administers, as well as related guidance material and tools, keep pace with current and emerging business models, user expectations, and best practices in the regulatory field. The regulations will be written to maximize clarity and predictability, minimize unnecessary regulatory burdens, and facilitate the identification and correction of non-compliance. A record number of Canadians turned to the CTA for assistance with air travel issues over the reporting period, with the CTA receiving over 5,500 air travel complaints. Between 2012 and 2016, the CTA received about 700 complaints annually. One air travel proceeding drew significant attention: the public hearing into the delays on the tarmac of two Air Transat flights on July 31, 2017, which was held on August 30 and 31, 2017 as part of an inquiry the CTA initiated on its own motion. On November 30, 2017, the CTA issued its decision in the case, finding that although the chain of events leading to the tarmac delays was sparked by weather conditions and that various actors had a role in how the events unfolded, the airline had not respected its obligations to passengers, as outlined in its tariff (the written document outlining terms and conditions of carriage), and that some of its tariff terms were not reasonable. The CTA ordered changes to the tariff and better training for staff, and one of its enforcement officers levied a fine of $295,000. The new air passenger protection regulations that the CTA will make pursuant to Bill C-49 will help improve the clarity and consistency of airline obligations to passengers with respect to tarmac delays over three hours, as well as a number of other areas: communication, flight delays and cancellations, denied boarding, the seating of children, and the transportation of musical instruments. The 2017-18 grain crop was the third-largest in Canadian history. Challenges on the western rail network began to be evident in late 2017 and had an impact on many commodities, including grain, forestry, and energy. Similar issues emerged in the United States. The introduction through Bill C-49 of a new mechanism called long-haul interswitching – which the CTA will implement − will help increase the freight rail options available to some shippers. The Bill also adjusted a number of other CTA-administered provisions aimed at giving shippers access to remedies when they have concerns about rail service and rates. Accessible transportation is a fundamental right, and the CTA's work in the area is guided by the ambitious, but attainable goal of helping make Canada's national transportation system the most accessible in the world. The number of Canadians with disabilities bringing issues to the CTA has been increasing. In 2017-18, the CTA received 123 complaints on matters related to accessibility of transportation services, almost double what was received in 2015-16. Accessible transportation was the focus of the RMI's first phase. Based on public and stakeholder consultations, the CTA is moving to integrate existing accessible transportation rules and guidelines into a modern, comprehensive accessible transportation regulation. In the course of RMI consultations, it became clear that challenges with the storage and transportation of mobility aids on aircraft have become more serious as these devices have increased in size and technological complexity. To help spur dialogue and innovation on this issue, the CTA organized an international forum on mobility aids and air travel that brought together airlines and their associations, aircraft manufacturers, mobility device manufacturers, disability rights organizations, regulators, and the International Civil Aviation Organization (ICAO). The Fall Economic Statement 2017 and Budget 2018 announced new funding for the CTA to implement legislative and regulatory changes related to Canada’s freight rail system. These changes will help support rail customers and deliver continued investments in the freight rail system to help it be more competitive and efficient in the long term. The new funding will also support the agency in its modernization initiative. Undertook a full assessment of its finances to identify possible efficiencies and resource needs. Continued to carefully monitor government-wide migration to shared corporate systems, applied resulting lessons learned, and took steps to address escalating resource demands. Efficiencies identified through the financial assessment implemented. Pressures stemming from rising complaint volumes largely handled through a slowing of other activities and temporary reallocation of resources. New funding for the CTA announced in Fall Economic Statement 2017 and Budget 2018. Enhanced outreach and awareness activities with stakeholders and the public regarding their rights and responsibilities, as well as the recourse available to them through the CTA. Continued to develop and implement a data-driven, risk-based compliance assurance program. The volume of complaints and inquiries to the CTA has risen significantly, suggesting increased awareness of its mandates and services. Progressed piloting of Compliance Assurance Program by starting work to adapt risk assessment model from foreign air carrier to rail and marine. Continued to pursue the RMI, a complete review of all the regulations it administers. Consultations on the first two phases of the RMI – related to accessible transportation and to air licensing, charters, and insurance – completed. Advanced the RMI by completing public and stakeholder consultations for two of four phases − accessible transportation and airline licensing, charters and insurance – and beginning the preparation of the regulations. Actual spending was 2.3% less than planned spending, while actual full-time equivalents were 7% less than planned full-time equivalents for 2017-2018 in the Economic Regulation program. Both differences mainly resulted from temporary resource re-allocation in order to manage an unprecedented increase in air travel complaints. The CTA provides formal and informal dispute resolution services to users, service providers and others affected by the federal transportation network, including facilitation, mediation, arbitration, and adjudication. As a quasi-judicial tribunal, the CTA has the authority to issue adjudicative decisions and orders on matters within its jurisdiction over federally-regulated air, rail and marine modes of transportation and, in respect of the CTA's accessibility mandate, interprovincial bus operations. It resolves disputes between: air travellers and air carriers regarding terms and conditions of air carriage; persons with disabilities and service providers regarding the accessibility of the federal transportation network; railway companies, shippers, provinces, municipalities and neighbors regarding a wide range of matters including railway level of service, infrastructure, crossings, interswitching, and noise and vibration. Implemented targeted strategies to raise awareness of the CTA's services through activities such as a strengthened online presence, keynote speeches by the Chair and CEO, and media engagement. Continued to manage a rising number of air travel complaints where the CTA received 5,500 complaints in 2017-2018 as compared to an average of 700 complaints annually for the years 2012 to 2016. Despite efficiency gained through process improvement and temporary resource re-allocation, the backlog of travel complaints awaiting facilitation continued to grow. The volume of air travel complaints continued to increase significantly. Although the CTA dealt with much of this increase through temporarily pausing or slowing activity in other areas and reallocating resources, the result was some decline in the percentage of cases resolved within service standards and statutory timelines, and a growing backlog of air travel complaints in the queue for facilitation. Actual spending was 13.6% above planned spending and actual full-time equivalents were 21.2% above planned full-time equivalents for 2017-2018 in the Adjudication and Alternate Dispute Resolution program, due mainly to the temporary resource re-allocation required to manage the increase in the number of air travel complaints. Information on the CTA's lower-level programs is available in the GC InfoBase. Improved people management through CTA's On the Move Action Plan, including development and implementation of an Onboarding program. Achieved the largest reduction of any federal organization in the harassment reported in the 2014 versus the 2017 Public Service Employee Survey from 24% to 10%. Targeted actions were taken to improve workplace mental health such as increasing promotion an informal peer support network, developing toolkits to support employees and holding a series of events to reinforce employee mental health at the workplace through a senior level champion mandated with the role. Created a dedicated Organizational Effectiveness Team to help foster a healthy, high-performing organization during a period of significant change and rising workloads. Implemented human resource and technology solutions to address new requirements to support resource growth resulting from the Fall Economic Statement and Budget 2018. 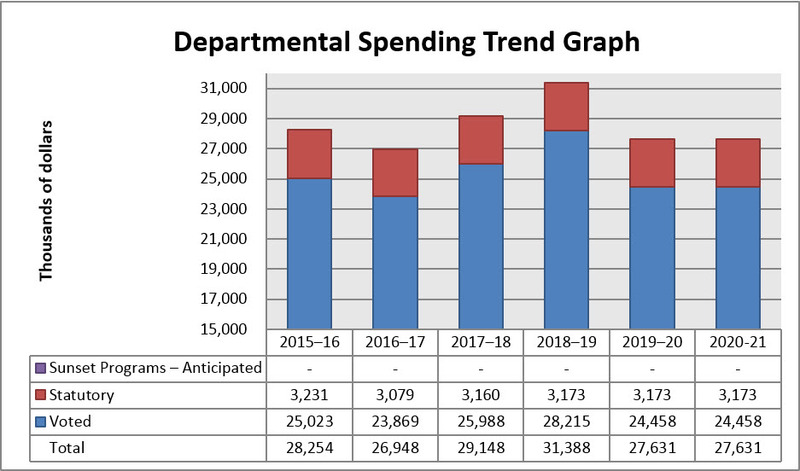 Actual spending was 25.2% lower than planned spending, while actual full-time equivalents were 11.3% less than planned full-time equivalents for 2017-2018 in the Internal Service program. The variance in spending was due to reprofiling funds into the future related to the Government of Canada Workplace Fit-up Standards project, led by Public Services and Procurement Canada. The CTA reprofiles the funds year by year based on requirements as the project evolves. The variance in human resources was due to a temporary resource re-allocation done in order to manage an unprecedented increase in air travel complaints. For fiscal years 2015-16, 2016-17 and 2017-18, the amounts shown represent the actual expenditures as reported in the Public Accounts. For fiscal year 2018-19, the planned spending reflects funding of $3.5 million approved through the Main Estimates to pay for the costs related to the Government of Canada Workplace 2.0 Fit-up Standards. This amount has been reprofiled from 2017-18 to 2018-19 and is reflected under the Internal Services Program. It will be reimbursed over a period of 15 years. For the period 2019-20 to 2020-21, the planned spending reflects approved funding by Treasury Board to support the CTA's Strategic Outcome and Programs. These expenditures vary slightly in previous years since they do not include the reimbursement of eligible paylist expenditures and operating budget carry forwards as these cannot be estimated with certainty. The 2017–18 variances between Main Estimates, planned spending, total authorities available for use and actual spending are largely attributable to the timing of the authorization of key elements of the fiscal cycle. The 2017-18 total authorities available for use ($33.7 million) represent the Main Estimates ($30.9 million), which include funding of $3.5 million to pay for the costs related to the Government of Canada Workplace 2.0 Fit-up Standards, plus adjustments to authorities approved by the Treasury Board, such as the Operating Budget Carry-Forward and compensation adjustments arising from the renewal of collective agreements. Total authorities available for use in 2017-18 ($33.7 million) were greater than the actual spending in 2017-18 ($29.1 million). The variance of $4.6 million is primarily due to the delays in the implementation of the Government of Canada Workplace 2.0 Fit-up Standards. As a result, expenditures were not incurred for this project in 2017-18 and the $3.5 million funding has been reprofiled from 2017-18 to 2018-19. Total actual spending for 2017-18 ($29.1 million) was greater than 2016-17 ($26.9 million). This variance is primarily due to the retroactive payments and increased rates of pay stemming from the renewal of collective agreements, as well as the increase in resources to address the workload associated with the increase in air travel complaints. Finally, the 2018-19 planned spending demonstrates a slight increase from the 2017-18 planned spending as it includes additional compensation adjustments arising from the renewal of collective agreements. On average, the full-time equivalents have remained consistent over the last three years. However, the CTA has streamlined the proportion of its human resources expenditures allocated to back-office operations, enabling it to re-allocate resources to the Adjudication and Alternative Dispute Resolution Program in order to address the workload associated with the increase in air travel complaints. For information on the CTA’s organizational voted and statutory expenditures, consult the Public Accounts of Canada 2017-2018. Information on the alignment of the CTA’s spending with the Government of Canada’s spending and activities is available in the GC InfoBase. The CTA’s financial statements (unaudited) for the year ended March 31, 2018 are available on the CTA's website. Total liabilities were $5.5 million at the end of 2017–2018, an increase of $0.8 million (17%) over the previous year's total liabilities of $4.7 million. This increase in liabilities is primarily related to an increase in the salary accrual due to the increased rates of pay stemming from the renewal of collective agreements, an increase in vacation and compensatory leave balances, an increase in payables recorded at year-end as well as an increase to the accrued severance benefit obligation. Accounts payable and accrued liabilities as well as vacation pay and compensatory leave represented the largest portion of total liabilities at $3.0 million and $1.4 million, respectively. Total financial and non-financial assets were $4.2 million at the end of 2017–2018, which represent an increase of $0.9 million (27%) over the previous year's total financial and non-financial assets of $3.3 million. This increase is mainly due to an increase in the Due from Consolidated Revenue Fund (the result of the increase in liabilities) reported under the category "Financial Assets" as well as an increase in tangible capital assets following the acquisition of videoconference equipment. Financial assets represented $3.1 million (74%), tangible capital assets represented $0.9 million (21%), while prepaid expenses and inventory represented 5% of total assets. The CTA's total expenses were $33.4 million in 2017–2018, an increase of $2.5 million (8%) over the previous year's total expenses. This variance is primarily due to the retroactive payments and increased rates of pay stemming from the renewal of collective agreements, as well as the increase in resources to address the workload associated with the increase in air travel complaints. The majority of funds, $28.1 million (84%), were spent on salaries and employee benefits, 6% on accommodation, 3% on professional and special services, 2% on rentals and the remaining 5% going towards transportation and telecommunication, machinery and equipment, information, amortization of tangible capital assets, utilities, materials and supplies and repair and maintenance. The CTA's Strategic Outcome and Program Alignment Architecture of record for 2017–2018 are shown below. Supporting information on lower-level programs is available on the GC InfoBase. Reporting results became possible in 2016/2017 as a result of past business process modifications, case management system enhancements, and refinements to the performance and reporting methodology.